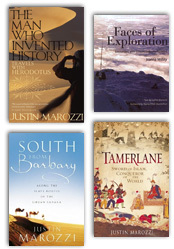 Tamerlane was the greatest conqueror the world has ever seen. No man carved out a larger empire with his own sword. His armies were irresistible, feared throughout Asia, Africa and Europe. Wherever they rode, death rained down around them like the plague. His very name evokes mystery and romance: the clash of swords on snow-clad mountains and the steppes of Asia; the legendary opulence of a cruel Oriental despot and the astonishing magnificence of his blue-domed capital at Samarkand, Centre of the Universe and Garden of the Soul. Not born of royal lineage, Tamerlane spent his early years in Central Asia as a struggling sheep-stealer and petty brigand. By 1370, after a series of cunning alliances, he had seized power locally, but a small kingdom was not enough for the man who aspired to rule the world. In the closing decades of the fourteenth century he blazed through Asia like a firestorm, riding to victory after victory at the head of a ferocious army of mounted archers. Cities were razed to the ground, inhabitants tortured without mercy, enemies decapitated. Towers of bloody heads, illuminated by beacons at night, were his most chilling monuments, terrible warnings to those ready to oppose him. On the ruins of Baghdad he had his princes erect a pyramid of 90,000 skulls. This was the man the Elizabethan playwright Christopher Marlowe christened the ‘Scourge of God’. The sweep of his conquests was staggering. Undefeated on the battlefield, he triumphed from Delhi to Damascus, Siberia to the Mediterranean, outshining both Alexander and Genghis Khan’s achievements as one by one the great cities of Asia fell before him. 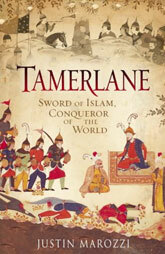 Tamerlane: Sword of Islam, Conqueror of the World charts the extraordinary life of a brilliant leader too long neglected by Western historians. It recreates the terrifying dramas of medieval warfare and relives the fabulous splendour of court life, where Tamerlane demonstrated his insatiable appetite for wine and women, battle and blood. realise his stunning portrait of this complex emperor and explore the vast cultural legacy he bequeathed. Master politician, illiterate warrior, formidable military strategist and exceptional chess player, Tamerlane was creative and destructive in equal measure, as dedicated to high culture as he was to ruthless conquest. The glorious Islamic art and architecture which he sponsored throughout his empire, the glittering palaces and sumptuous parks, the mosques and mausoleums of his beloved capital Samarkand, were without equal in the world. This is the story of one of the most remarkable men who ever lived. It is compelling history of the highest order.